Want to be hired by Chloe? 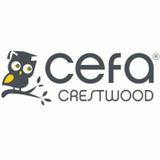 CEFA Crestwood Junior Kindergarten (Between No.6 and Westminster Hwy) is looking for an experienced Early Childhood Educators for Full-time permanent position starting in as soon as possible. Candidates must be passionate about working with children under 5 year old.
. A comprehensive compensation structure is offered with an additional 15% over a 3 year wage grid. Starting with two weeks vacation and 4 days sick days with paid.